This raglan sleepwear is inspired by the oversized sports t-shirts that are perfect to wear to bed. It has two length options: a longer, more traditional length gown that hits right below the knee and a shorter, and comfy long shirt that hits about mid thigh. 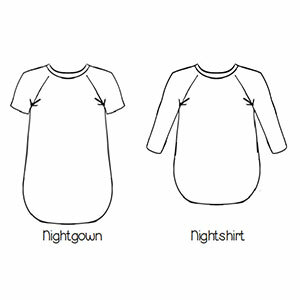 There is also the option of either long, 3/4 length or short sleeves. The hem facings give a clean, finished look, with a peek-a-boo hem. It is practical and comfortable, but still cute with the curved hem & slits on the sides. 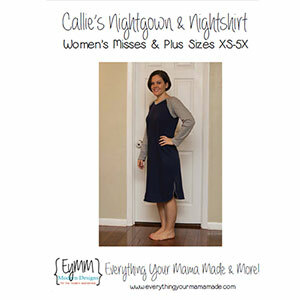 This women’s nightgown and nightshirt pattern offers 10 sizes: Misses XS-XL and Plus Sizes 1X-5X. 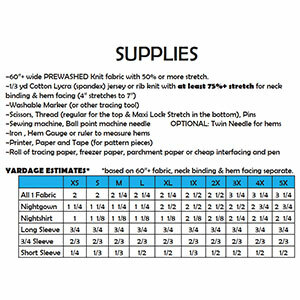 Suggested fabrics are cotton jersey, cotton lycra, interlock, french terry, ponte de roma or fleece.